Recently made a walnut end grain cutting board and after A LOT of sanding I’ve got the surface flat and smooth but cannot get rid of these spots. I’m assuming I pressed glue into the grains when attempting to clean up the squeeze out, but I could be wrong. Either way, they aren’t coming out. I don’t have a drum sander and I’m not putting it through the planer so my options are ROS or belt sander. The belt sander is removing too much I think and the spots still don’t seem to be going away so I’m at a stand still. Has anyone else dealt with this before? Is it a lost cause or should I just keep sanding? In the attached picture I sprayed it with a little water to show the spots I’m referring to a little better. Give us a few clues to go on. Does the cutting board (as photographed) have anything on it other than the glue? What glue did you use? What did you use to wipe off the squeeze-out? Are the white spots sanding waste or soaked in glue? 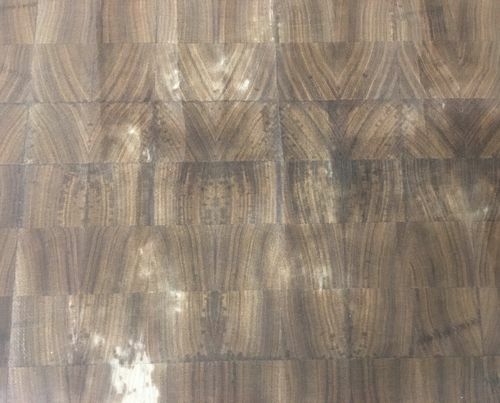 Being end grain, the discolorations may have penetrated deeply. Just has water on it in the picture, the lighter white spots is just where it dried. I used Titebond 3 to glue it up and I whipped off the squeeze out with a damp cloth. Thanks in advance! New to the board, is this the proper forum? I whipped off the squeeze out with a damp cloth. That is your mistake right there, next time just leave the glue alone. It will sand right off. As for the fix on this one, I don’t know, except to suggest using really coarse grit paper like 40 grit until you get below the glue. Thanks, it’s currently 1.5” thick so I’ve got a little room to work if I make another attempt to sand. I’m assuming the water from the cloth thins out the glue enough to allow it to penetrate the grain deeper than the glue will by itself? Just the act of wiping the squeeze out off pushes into the end grain. Let the squeeze out dry ( it will stay on the surface) then scrape it off and sand. Try using a carbide paint scraper to get as much off as you can before you start sanding it. It could take a while, especially in end grain, but if you don’t have a drum sander or portable belt sander, the scraper may be the quickest way to get there from here. Thanks, it s currently 1.5” thick so I ve got a little room to work if I make another attempt to sand. I m assuming the water from the cloth thins out the glue enough to allow it to penetrate the grain deeper than the glue will by itself? That about sums it up. I used to do the same thing (one of the things I had to un-learn from growing up watching Norm), but kept running into the same problem. Especially for flat glue-up’s like this, letting it dry then scraping it off is the way to go. This won’t help with with your current problem, but if you make another end grain cutting board, use less glue. I know that sounds self evident, but it should be said anyway. I have made a number of end grain cutting boards. Using a small paint roller, I spread glue moderately on one side of the laminate pieces and rub them together with their dry mating piece to spread the glue before clamping. This produces very little, if any, squeeze out; and what there is can be scraped off with a card scraper or knocked down with a hand plane after it dries a bit. End grain soaks up glue, especially if it’s thinned with water. The method I described results in virtually no staining and gives you a strong joint. In a few places the stains are in the exact same spot on both sides so I think I’m done sanding as that is probably not a coincidence. Next time less glue and let it dry. Appreciate the advice/suggestions!